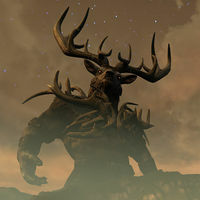 Hircine is a Daedric Prince whose sphere is the Hunt, the Sport of Daedra, the Great Game, the Chase, and is known as the Huntsman and the Father of Manbeasts. Hircine created the various therianthropic diseases which transform mortals into beasts, and is therefore the guardian of were-creatures. They reflect his sphere admirably, hunting at night and being hunted by day. Hircine's existence appears to have been discovered later than other Daedric Princes, as he doesn't appear in the most ancient records and summonings of him were rare or non-existent. Hircine is a sportsman who enjoys giving his prey a chance for victory, however small. He is typically portrayed with a great spear and either the head or skull of a deer. Hircine's enemy is Ebonarm and his summoning day is 5th of Mid Year. Hircine appeared in 16 Accords of Madness, Volume VI, where he imbued a Daedroth with the curse of lycanthropy, making a creature which became Hircine's most deadly hunter; however, the monster was tricked into committing suicide, causing the Prince of the Hunt to curse the peak where it happened. When the forces of Mehrunes Dagon attacked the Battlespire during the Imperial Simulacrum, Hircine's Wild Hunt was taking place in the small pocket realm known as the Chimera of Desolation. On a quest to defeat Dagon, the Hero of Battlespire passed through the realm and became the Hare of the hunt. Using the Savior's Hide and the Spear of Bitter Mercy, the hero defeated the Huntsman, the Herne Egahirn, and escaped the realm. The Nerevarine fought and defeated Hircine when he attempted to enter the mortal plane in Solstheim. Hircine's typical lackeys on the mortal realm Nirn are werewolves, which he directly talks to, gives tasks, and rewards with additional powers. Hircine hosts a great hunt every era, pitting various prey of his choosing against one another. The exact nature of each hunt varies from era to era. The Ring of Hircine (also known as Hircine's Ring, or The Hircine Ring) is a Daedric artifact created by the Daedric Prince Hircine. In appearance, it is usually an engraved metallic ring showing the head of a wolf, although it has also been known to appear as a spiked leather buckler. The ring can temporarily give the gift of Lycanthropy to the wearer, and allows lycanthropes to control their transformations. Lycanthropes who possess the ring are not affected by the moons or by bloodlust, and can change form at will. Hircine punishes those that did not legitimately earn the ring, stripping the ring of its ability to control transformations and instead making transformations unpredictable. For non-lycanthropes, the ring is often useless, although it has been known to extend the wearer's life and allow for transformation into a werewolf. The ring is known to affect werewolves and wereboars, and likely works on other lycanthropes as well. Tharsten Heart-Fang, a great leader of the Skaal of Solstheim, possessed the Ring of Hircine for many generations in secret, unnaturally extending his life and youth. However, in the events leading up to the Warp in the West, an agent of the Blades summoned Hircine through the Glenmorial Coven and was tasked with killing an ungrateful wereboar for the Prince. In return, a worshipper of Hircine gave the ring to the agent. By 3E 427, Tharsten was again in possession of the ring when he was captured by the Hounds of Hircine to act as Prey during the fulfillment of the Bloodmoon Prophecy. He was brought to the icy tunnels within the Mortrag Glacier, and took part in Hircine's Hunt. Tharsten encountered the Nerevarine during the Hunt, and used the ring to transform into a werewolf and attack. The Nerevarine defeated him and became the new owner of the ring. Circa 4E 201, the Forgotten Hero along with an adventuring party ventured to Thornwell Farm near Riften chasing rumors of Barilzar's Mazed Band, having heard that the local farmer there was in possession of a magic ring. There, they fought off other treasure hunters and learned from the farmer that he lost the ring in the nearby forest. Within the forest, the party found a werewolf who attacked them. After defeating it, they learned it was the farmer's son. The farmer begged the Forgotten Hero to let him keep the ring, as it helps his son control his curse, but stories conflict on what was ultimately decided on. Some say that the Hero did a great deed and let the farmer keep the ring and thereby earned the favor of the wolves, while others say that the Hero took the ring and was cursed by the farmer, resulting in unpredictable transformations for whoever wore the ring. The ring subsequently was found in the possession of a Nord werewolf named Sinding that same year, who stole the Ring of Hircine in an attempt to control his transformations. His plan backfired when Hircine cursed the ring, causing the wearer to transform at random and making it impossible to take off unless another willingly accepts it. Sinding was captured in Falkreath and thrown in jail for killing a little girl in his beast form. The Last Dragonborn visited Sinding in his jail cell, and accepted the ring from him, hoping to appease Hircine and have the curse removed. Sinding escaped from jail, and the Dragonborn hunted down a rare White Stag to earn the Prince's favor. Upon contacting Hircine, the Dragonborn learned that the Prince would not forgive Sinding's betrayal, and had tasked hunters with killing and skinning him in return for the Savior's Hide. It is unknown if the Dragonborn joined the Hunt and lost the ring, saved Sinding from the hunters and had Hircine remove the curse, or betrayed Sinding by eliminating the hunters before turning on him and claiming both artifacts. Savior's Hide, also known as Scourge of the Oathbreaker, is a Daedric artifact commonly associated with Hircine. The name Savior's Hide is usually associated with just the cuirass, but a full set of the hide once existed (boots, cuirass, gauntlets, greaves, helmet, and pauldrons), though the rest of the items have not been seen since 3E 399. The cuirass makes the wearer resistant to magic. There are two creation stories to the Hide, the widely known one crediting Hircine and the lesser known one crediting Malacath. Of the two stories the one involving Hircine has more truth, as the story crediting Malacath claims that the armor as a whole makes the wearer vulnerable to magic and invulnerable to the blow of an oathbreaker. It agrees on the point that the Hide would protect the wearer from the sting of the Spear of Bitter Mercy. The more widely known legend holds that Hircine rewarded the first and only mortal to escape his Hunting Grounds with his peeled Hide. The mortal then had the Hide tailored into the cuirass for use in their adventures. This version also holds that the cuirass has a special ability to resist magic. For more information see the main Lore article. The Spear of Bitter Mercy is one of the more mysterious artifacts in Tamrielic lore. Little to nothing is known about the Spear, but it is believed to be of Daedric origin. According to Reachmen myth, the Daedric Prince Hircine was said to wield the Spear when he took on the aspect of Alrabeg the Hunter. Other legends speak of a Nord hunter named Thane Icehammer, who unknowingly killed several were-creatures while on a hunt. Angered by this, Hircine thrust the Spear into Icehammer's side, where upon the tip broke off and remained lodged inside him. Slowly, the magic of Hircine's Spear corrupted Icehammer's mind and he became bitter and angry. This eventually resulted in him murdering an acolyte of Kyne in a fit of rage, and fleeing to an ancient burial vault near Cragwallow, where upon he was sealed within as punishment. Over time, the Spear resurfaced and according to some legends it was used by a mighty hero during the fall of the Battlespire. The hero was aided by the Spear in the defeat of Mehrunes Dagon and the recapturing of the Battlespire. Since that time, the Spear of Bitter Mercy has made few appearances within Tamriel. It was last reported to be in the hands of the Nerevarine, who received it as a reward from Sheogorath in 3E 427. The Nerevarine sold it to Torasa Aram, who put it on display in the Mournhold Museum of Artifacts. Early in the Fourth Era, visitors to Hircine's plane of Oblivion, the Hunting Grounds, described it as a realm of thick forest and open plains where they were hunted by a werebear, who looked like an extremely large man similar to a pale Nord with sinewy arms, covered in blue tattoos and leading huge bears; then a herd of wild, unknown cattle. If the horn of Hircine is heard there, it announces Hircine himself and his pack of werewolves. For game-specific information, see the Bloodmoon, Oblivion, Skyrim, and ESO articles. This page was last modified on 23 December 2018, at 01:17.